For most bachelors (and spinsters for that matter), moving to a different town is a common part of adult life. Most of them, while independent, may not be able to afford having to rent a whole home for their own. That’s where the provision to rent only a room or portions of a house already occupied by someone else seems like a blessing. Like we said, this being the best choice for young and single people, many families living in the metros have opted to open their homes for such people. The additional income from such an arrangement is also another benefit for the average families. Even though in this arrangement the landlord gets to keep a closer eye on his tenant(s), it is still a wise choice to have a rental agreement in place. This agreement too is pretty much like the conventional rental agreement, but it has slight differences as some facts are different. A primary difference would be that the fact that only certain parts of the home is accessible to the tenant is clearly mentioned. The contract needs to spell out exactly which parts the tenant can occupy along with other factors like terms of using the common regions. What Should Be Included In A Room Rental Agreement? A lot of attention has to be paid to the clauses that go into a room rental agreement. Since the landlord and tenant may co-occupy the same property, clear restrictions must be drawn up so that either party remains undisturbed. Prepare the contract carefully. Ensure that all clauses and terms required by both owner and tenant are included. Print the prepared agreement on stamp paper of recommended value. Every state has different rules on the stamp duty to be paid. Pay attention to this. Owner and tenant should then place their signatures on designated places on the contract in the presence of two witnesses, who must also sign the contract. Tenant then pays required stamp duty and lets the owner keep the original contract while the tenant keeps a copy of the same. If you are skeptical about creating a rental agreement yourself, you’ve come to the right place. 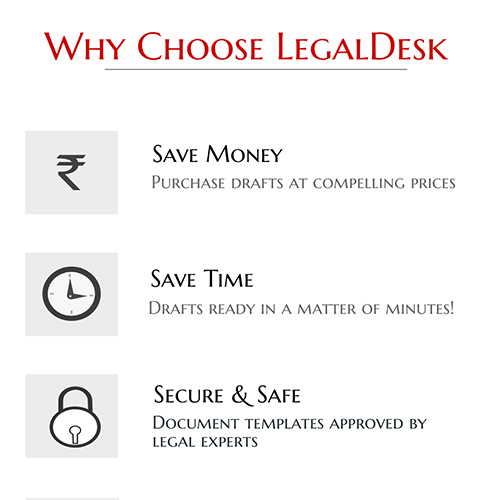 LegalDesk has pre-drafted, legal expert verified, ready to use templates which you can prepared in under a few clicks! Go ahead, create a room rental agreement with us now!! !